The Oklahoma city metropolitan area has so many restaurants to choose from. Whether we want food in Bethany, Downtown, Midtown or Edmond, it is often hard to choose. Sushi is something that many people are picky about, and it can also be difficult on the pocketbook. After comparing location, price and flavor, I have found several restaurants that could your new favorite spot. The first popular spot is Ding Asian Fusion. This is a restaurant that offers multiple entrees as well as sushi. It is a fairly new restaurant that opened up last summer in Downtown Bethany. The location is perfect for SNU students because it is directly across from the Sawyer Center. They are closed on Mondays, but open the rest of the week at 11 a.m.. On Sundays and weekdays, they close at 10 p.m. but stay open until 11 p.m. on Fridays and Saturdays. Their Facebook rating is 4.9/5 stars and their Google review is 4.6/5 stars. I have eaten sushi here and was impressed with the flavor and the prices. The modern look of the restaurant, excellent service and delicious food is sure to please anyone who goes there. The second spot is Sushi Neko. This place is located at 4318 N. Western Ave. From SNU, it would take 10-15 minutes to drive there. They are open everyday except Sundays. On weekdays, they are open from 11 a.m. to 11 p.m., and they stay open until midnight on weekends. Their Facebook rating is 4.6/5 stars, and their Google rating is 4.⅗ stars. This place is my all-time favorite spot to get sushi, so I was surprised to see the ratings were lower than Ding’s. The prices are higher, but I can promise you will not be disappointed. The third spot is The Sushi Bar. This restaurant is actually a chain that has two locations: 1201 NW 178th St, Suite 123 in Edmond and 6432 W. Memorial Rd. in Oklahoma City. These locations are a bit farther than the others, but I have never had a bad experience at either place. The Memorial location is open Monday through Thursday from 11 a.m. to 10 p.m., Friday and Saturday from 11 a.m. – 11 p.m. and on Sundays from 12 p.m. – 9 p.m. The Edmond location stays open until 1 a.m. Thursday through Saturday, because they offer half priced sushi from 11 p.m. until they close. Their review on Facebook is 4.9/5 stars, and their Google review is 4.6/5 stars. The last restaurant, Nhinja, is the cheapest and has the most locations. There are 5 current locations in the Oklahoma City metro: 2 in Oklahoma City, 2 in Edmond and 1 in Yukon. No matter where you are, you can find a Nhinja close by. This spot is more of a quick dining option. They are open every day from 11 a.m. to 9 p.m.. Their review on Facebook is 3.3/5 stars, and their Google review is 4/5 stars. I personally am not a huge fan of this place, but it is pretty popular because it is very cheap. I chose these four restaurants to compare because I have heard people talk about these the most. 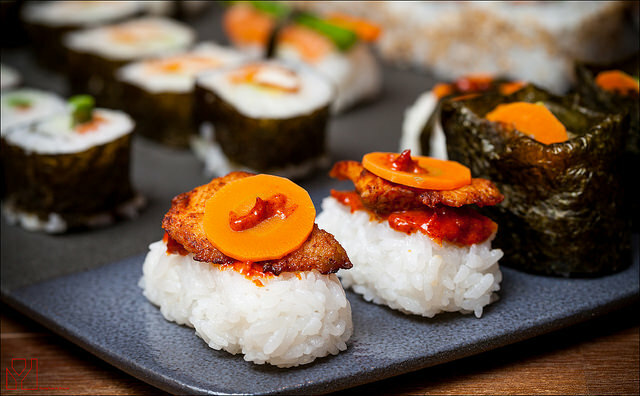 My suggestion would be to get the Firecracker roll or Tuna Nigiri at Sushi Neko, but any of these restaurants are great options to get your sushi fix.